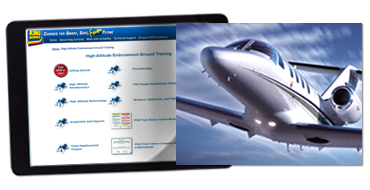 Get your ground training sign-off in just two hours! This is a fun, quick way to get the ground training endorsement the FAA requires so you to act as PIC of a pressurized aircraft that is capable of flying above 25,000 feet. Get the state-of-the-art, best training available today with the ease, speed and portability of online training. Plus, you'll also get an invaluable, downloadable High-Altitude Operations Cockpit Card—you'll have the critical rules for oxygen use in a pressurized aircraft and tips for radar operation easily at hand. And when you complete the course, you can instantly print out the course completion certificate and an endorsement for your logbook. It's that easy! Practical and to the point course, but much to expensive for what was presented. Good material, presented in a very easy to comprehend manner. A bit pricey, but I needed the endorsement. Very convenient. Lost a star due to the price. The course was straightforward and to the point. Did the job with a minimum of fuss. 4 Stars for the course itself. Everything was fine and appropriate except the price. It seems to me the price reflects a taking advantage of flight students with few other options for this course. This course was very simple to build, comprised of basic materials and I strongly suspect was very inexpensive to develop, when compared to the video courses. 1 star for the price Average - 2 stars. Great course, similar to the part 141 courses I took for PP and IFR. Nice to know what to expect. I have used King online for every rating and endorsement I have received. I want to thank all the good people that make this possible. It has been a great experience! good course and I learned a few new things but its a bit over priced at $249. Regardless its quick, convenient and there aren't many other options. The material is presented so it is easy to pass the test question but it wonder how much I will forget. Expensive but worth it if you just want to get it done hassle free. This course is a must for flying the flight levels. I wish I would have completed it a long time ago. The information is enormously useful and delivered in a way that is so easy to understand. I never understood how the different parts of the atmosphere interacted, there temperatures and thickness at the poles until now. Nice work and thanks for making me a safer pilot! Covered all of the necessary topics. Covered all of the necessary topics. Price too high for the presentation level and content however. Got the job done. Very informative. Meets the requirements. Not the John and Martha I am used to (No Video). Got the job done however. Well worthwhile for any private pilot. Lots of good info on the effects of oxygen (or lack thereof) in the air. My first disappointment with King products, I expected the normal, enjoyable, and interesting John and Martha video but instead you get pages of reading material, and a few test questions. This is not worth $249 by any stretch of the imagination. I benefited the most from the High altitude aerodynamics and meteorology. The rest I had covered during my commercial training. Money well spent very thorough course that covers everything you need to know about high altitude flying and more! I found this course had a great mix of reviewing basics all pilots should know along with some very good training and detail on high altitude information. Very easy to use course and interesting material. Effective learning tool and certification course. Well organized with small modules and frequent quizzing to reinforce learning. Well worth it! Got it done in one afternoon. Call them to package this course together with another Professional Pilot course for a HUGE discount!! Awesome course! great for understanding, reviewing! The high-altitude course is very intuitive and straight forward. At first I wasn't thrilled about a non-video course but the way it is broken down and quizzed after each module is highly effective and enjoyable. I will recommend.